If you’ve never heard of Corey Smith I’d like you to take a moment and Google him. For a moment ignore the Rhapsody’s of the world trying to get you to buy from them and ignore the blogs (but never this one!) and look at Corey’s website. I’m sure one of the first things to catch your attention will be the free songs section so go ahead and click. There, scroll through the tracks of early demos, outtakes, and popular singles that have made Corey Smith the popular musician he is. Then notice that all these tracks are free with the only instructions being to “download.burn.share”. This is about the time you should realize that Corey Smith is what the music business world is becoming. Cory Smith is no stranger to this blog, he’s been deemed worthy of having his own feature in AMJ’s “5 things you should know” section. As an Athens musician who has made a name for himself with bar-friendly anthems such as “21” and for putting on shows that even a 21 year old’s budget can handle, he’s one of the best guest lecturers to have at a Music Business class. So Mr. Smith has once again graced a new group of music business hopefuls with a first day of class introduction and some indulgent question and answering. Listening to Corey talk is a great experience because he explained the framework that he uses day to day in making his decisions as an artist. The framework split between two different endeavors: art and commerce. Even in music business, sometimes discussion will focus and favor one over the other but he linked the two closely. Corey discussed learning to operate where both of these views came together and how that has mostly allowed him to keep both his vision and his audience. When asked about the notion of an artist selling out he had a perspective that I had never heard before, that selling out did not have to be an all or nothing deal; compromises could be made on a record with tracks that are more commercially viable sitting snugly with songs the musician wouldn’t change for all the airplay offered. Now let’s go back to the start of this little story, back to the fact that Corey gives away a substantial amount of music on his website and has virtually no regret about doing so. During his lecture Corey reminisced to the days of giving away his CDs in restaurant parking lots just so his music would be out there. This ideal didn’t change as his popularity grew and Corey freely admits to telling concert goers to burn discs and hand them out among friends. Now it’s one thing when Radiohead put their album up online with a name your own price promotion or when Nine Inch Nails put their album online for free downloading: these artists who have had years to establish their name and to take a gamble on their usually loyal fanbase. But Corey has proven that this business model works even for indie artists, trusting that your audience will not only listen to your music but give them to friends and bring them to shows. Don’t believe me? 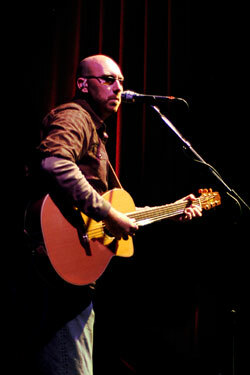 Last semester one of the Music Business teams was assigned to a Corey Smith concert. We applauded them the next day for a sold out concert and as we left class I heard someone saying that tickets were being scalped at double the price.It seems that Corey Smith has found a most comfortable spot between artistic integrity and business smarts.